Many a time, we are on the look out for simple edibles that we can create in a short span with minimal efforts. One such afternoon when I was in no mood to indulge in anything tedious, and was wondering what to do, my mind wandered to the phyllo pastry lying in my refrigerator. A recipe I had read on the backcover of a carton suddenly flashed in my mind. 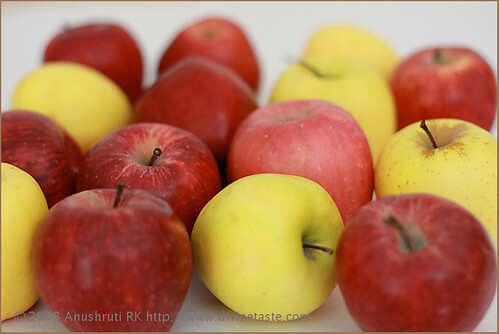 A quick glance towards my fruit basket revealed fresh and juicy red apples. I also remembered a pot of cinnamon powder lying in my store cupboard. What more could I ask for? Some butter and sugar and I was on my way, making these lovely slices. Crisp, tasty and simple is how I would describe them. This is really simple to make and the next time around I'm going to be experimenting a bit. Substituting the butter with almond or walnut oil and maybe introducing some dry fruits like almond or walnuts between the apple slices. Phyllo pastry is one of the most versatile things I have come across. It can be used for sweet and savoury dishes with myriad combinations. These sheets are not easily available in India. One of my friends who resides in the US and who uses phyllo quite often offered to send it to me, in her excitement completely oblivious to storage regulations for it to reach me from a place thousands of miles away, in an intact and usable form. Fortunately I came across phyllo in a gourmet store in Mumbai, exorbitantly priced but nevertheless gave me a chance to experiment. Unfortunately they have stopped stocking it and that means I cant play around with phyllo as much as I would like to, atleast until I come across another source. These slices are quick and easy to assemble. They heat well and can even be served cold or at room temperature. They taste delicious when served hot alongwith a scoop of good vanilla ice cream. 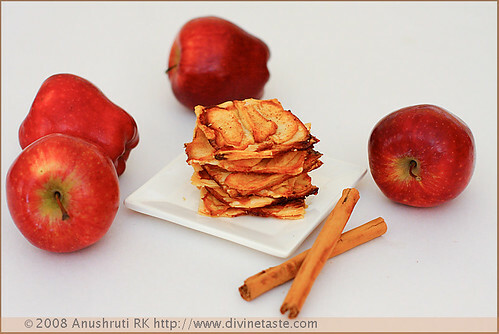 Peel, core and slice apples thinly lengthwise. Mix the sugar and the cinnamon powder. Brush each sheet of phyllo pastry with the melted butter using a pastry brush and layer them one above the other. Cut into equal square slices depending on the desired size. 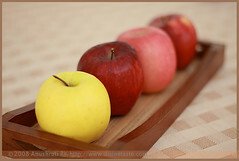 Arrange the sliced apples on top so that they overlap each other. Dot with butter and sprinkle half the sugared cinnamon powder. Preheat the oven for atleast 10 minutes. Bake at 180 degrees C for about 25 minutes to ½ an hour. To make them extra crisp sprinkle the remaining sugared cinnamon and bake at 200 degrees C for another 10 minutes until brown and crisp. When do I eat it? Simply awesome. You were the first one to eat it. The next time you are getting it when I trace phyllo in a store. This sounds gorgeous, and looks great in the photos. Nice blog – looking forward to more recipes. The photos are beyond adulation! This site is oozing with TALENT, waiting to pour out!!! though u r a science student with Rolling Shelde for chemistry with MBA Sure u r going to be a scientific cook with proffessional touch,My sinsere prayer for ur further achivements. Fabulous pictures and a very neat website with rare recipes… wishing you good luck for the future posts and looking forward to them. are phyllo pastry sheets available in mumbai . If yes, please advise name / contact details of the dealer. Hi – Just chanced upon your website! It is great… and yes, cooking in India does become a challenge! I blog from Gurgaon and can't even get my hands on a bag of chocolate chips and have to get them all the way from Delhi! Phyllo – no shopkeeper in Gurgaon seems to have heard about it also :)!!!! Do visit mine whenever you have the time. Just discovered your site (too good……) while searching for pastry sheets in Mumbai. By now do you know of any one who sells them? Madhuri: You can find it at Godrej Nature's Basket.